Battle Of The Breedables: Enter The Wildwood.. It was always inevitable that when breedable animals hit the grid cats and dogs were going to be at the top of the list. 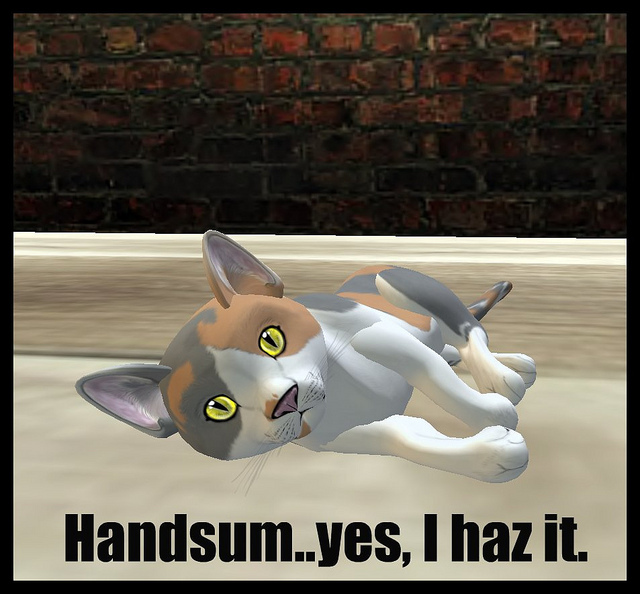 In fact, when you consider the success of Neko in Second Life, it was always fair to assume that cats would be amongst the first ever breedable pets. But they weren’t. We’ve had chickens, turtles and then the hugely successful Ozimals bunnies, who are still immensely popular despite recent issues that have impacted both the popularity of the product and the perceived capabilities of the Ozimal management structure, issue that I’m happy to report Ozimals appear to have embraced and addressed. Indeed, they seem to have entered a plateau phase, and with the recent Linden Lab tie-in new blood has been brought into the bunny-fold. But still no cats? 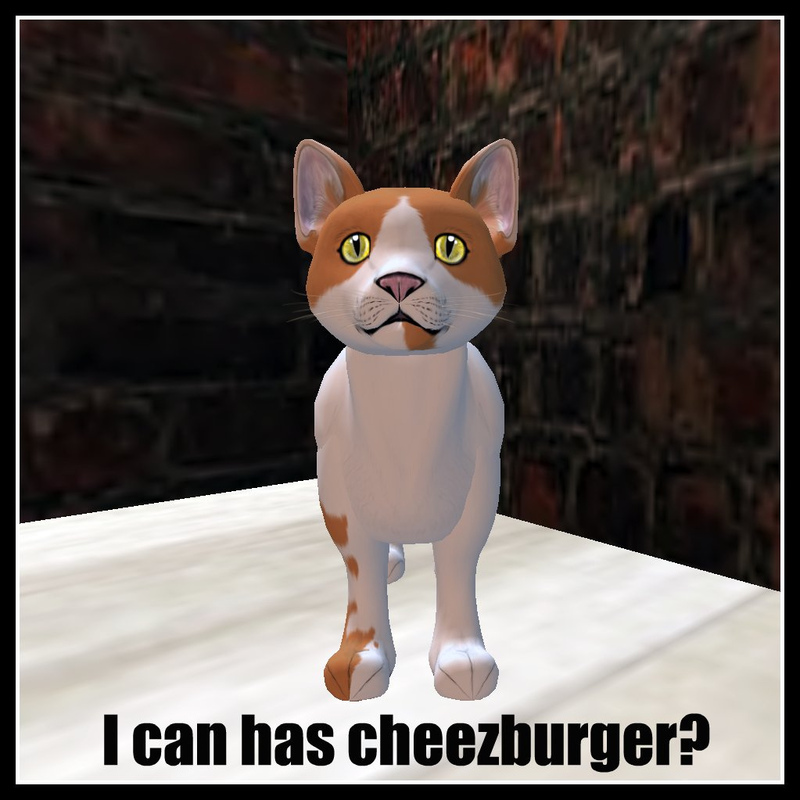 Was it the knowledge that bringing a cat breedable to the grid would have the potential to turn Second Life into Second Cat? Or was it just too difficult to embody the elusive cat in a bundle of pixels and prims? 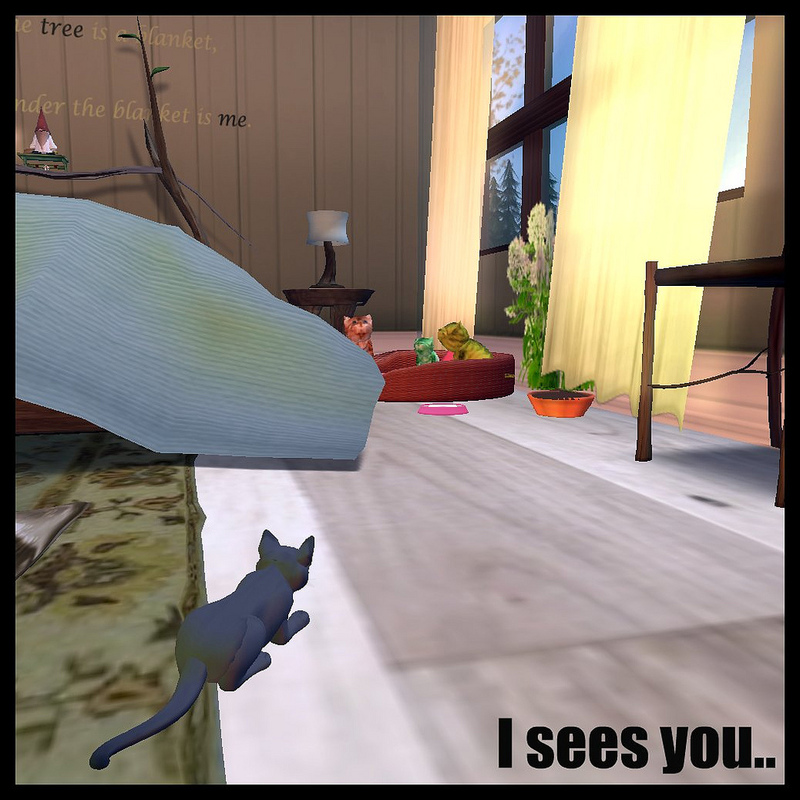 Cats are hard enough to get to grips with in real life, doing the same in Second Life would surely be an impossible feat. 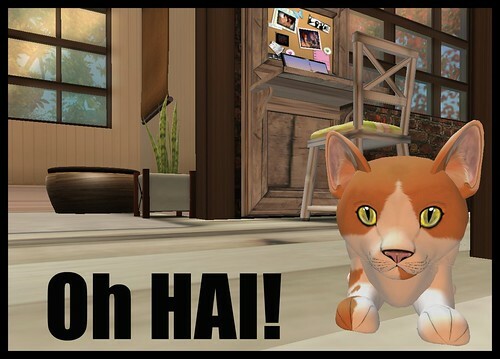 Well, as readers of my blog will know, just a few weeks ago the first breedable cat WAS unleashed on the grid, and guess what? There’s already another staking a claim on the virtual catnip. Those Krazy Kitties, small crayola-coloured spiky bundles of fun that are still in a beta phase. It’s been hard work for the team, but they have proved themselves a dedicated and worthy bunch, listening to the beta testers and putting their ideas into practise. Many updates later, there’s no release date as yet on the Krazy Kitties, but the fundamentals seem solid enough. It’s the issues with scripts that are going to cause the main discomfort for this brand, and ultimately the actual appearance of the kitty itself. When I first talked about the Krazy Kitty I mentioned that, to be frank, their appearance was going to need some work to ensure mass audience appeal. The kits are lovely and plump, but their backs are slightly spiky (presumably to affect the appearance of fur) and their features ill-defined. The textures are, sadly, not great. Primary colours don’t tend to blend in well with the décor of most Second Life residences, and the fact that the kits don’t yet have discernible or different coloured eyes is a cause for concern. Breeders like traits in their breedables, but the only traits thus far in the Krazy Kitties are the techni-coloured coats which are actually staying for release. You have to BREED to gain an authentic looking kitty coat, something that would make such furs expensive to attain and highly desirable on a secondary market. But will the Krazy Kitties be popular enough to generate such a market? A couple of days ago my answer would have been an unwavering affirmative. You know, when I first saw the Wildwood Cats my initial thoughts were of total sympathy to the Krazy Kitties brand, because as appearances go, Wildwood have nailed it. Why is it that good ideas don’t tend to come alone, they tend to come in pairs. The rotten part is, they often hit different people at the same time, such is the cruelty of the Gods.The Krazy Kitties crew are a great team, available to help with issues 24/7 and always open to suggestion, so to see another breedable cat appear on the grid now, let alone one that looks as stunning as this must have been a cruel blow. You can only feel sympathy for them-but let’s be honest here; ina beauty contest who would win? Wildwood have applied the the same attention to shape and detail that Amaretto and Ozimals before them have deployed on their products which is one of the contributing factors to their success. In fact I will stick my neck on the block here and say you will not see a better looking breedable on the market than the Ozimals bunny, and if you needed further evidence of that then the elite releases at Halloween should have allayed any doubts you may have had. Appearance is all; a product has to be aesthetically pleasing for you to want to buy it and persevere with it, and believe me when I say these pussies are totally glorious to behold. But looks can be deceiving, it’s the total product that matters, and when word began to trickle through last night that Wildwood was about to start its Beta phase I knew I wouldn’t have long to wait until I saw what these pretenders to a throne already Krazy Kitty inhabited would have to offer. And the fact is dear reader, right from the offset I can only say these are a great product. Not only that but Wildwood have taken a very trusting and civil approach to their Beta programme. The Beta box that arrived jam packed full of goodness in my inventory not only contained instructions, food and toys but also COPYABLE cats. This of course means that Beta testers can populate the grid willy nilly with Wildwood cats during this testing phase, which of course is a totally tempting but daft thing to do. A beta is a testing phase and that means things will break, settings will corrupt, scripts will stupify and more often than not the darn things just won’t work.But sometimes you get a feeling about a product, and this one certainly had my ‘witchy sense’ tingling. Straight away I knew Wildwood had potential because of the amount of ‘stuff’ that came in the Beta box; not just physical objects either; an FAQ, Manual, more note cards detailing instructions to testers and most impressive of all, a wearable instruction booklet that fits onto the HUD centre of your screen. This booklet, and in fact all the writing in the package, was totally straightforward to understand. Even if you don’t come from a Breedable background it’s not going to be difficult to get to grips with operations when you have your information presented in such a beautifully illustrated and entirely comprehensible way, so bonus points for that then. The menu for each cat is easy to use and features terminology that’s applicable to pretty much every Breedable on the grid. In fact the menu is practically an amalgamation of the bunny and horse menus. Of course you need to set a home location, a range and name your cat, but you can also opt for movement and animations to be on or off, as well as sound. Like Krazy Kitties, Wildwood Cats are a noisy lot, and the wowing and purring met with my real-life cats seal of approval. ( Well, actually it didn’t, my cats looked alarmed and looked around for the intruder in their midst)So far, so good. And even harder to believe, thus far I’ve not had a single issue to report back to the test forum. NOT ONE. For a Beta release this is unprecedented, but we’ve not quite hit 24 hours since release. Still, it bodes well for Wildwood. The real challenge will be when cats reach breeding age at 7 days old, then we will see how long pregnancy lasts, and if multiple births are an option too. At present there aren’t any scripted holds in these cats, but on release they will be totally huggable, something to look forward to. My first impressions are, well, beyond good. Ok, I’m TOTALLY in love with them, they’re gorgeous and fun and EVERYTHING you need a breedable cat to be. In fact, this has all been handled so totally professionally it makes me wonder if the creators behind the product have had past breedable creation experience in Second Life; I’m almost certain they have. The whole Beta release feels almost superfluous to requirements because these cats are working so well already. Of course a BETA is still a necessity, but Wildwood have evidently been working their butts off, researched the requirements of the market and they’re going to hit it with both barrels come release day, and believe me when these critters hit the grid you will notice. I actually think these cats in particular have the potential to be bigger than the bunnies and the horses combined, and that is both a blessing AND a curse. We’ve seen how the secondary market has been left to run amok and impacted the Ozimals and Amaretto brands, so it’s essential that Wildwood learn from both these examples and ensure that steps are taken to ensure that whilst a secondary market will exist it won’t become crippled after a few short months of manic buying and sky-high pricing. There’s also another element to consider; Wildwood could potentially help both the bunny and horse markets too in a rather unprecedented way. They could attract those left disillusioned by happenings in the bunny and horse business, and find a niche for themselves in this new cat world. This in turn could enable the existing markets to breathe and attract even more new followers to the ranks to foster new growth. You know, we could yet see a return to the glory days of the Breedable business, but in a slightly more sustainable and healthy way. Wildwood could contribute to this in a number of ways, eg by limiting the amount of breeder or starter packs per avatar on release day. Such an idea may horrify you, but an initial limit on purchasing will encourage breeders to breed and resell their own stock amongst their peers. Wildwood will still make a terrific profit on food and cat essentials as well as future releases. Taking baby steps like this at release could guarantee a healthy start to what could be an enjoyable business in-world. I really hope Wildwood make a move similar to this one; within days of the horses going on release there were sims already bursting at the seams with foals, and already the horse market is starting to struggle just a matter of weeks after release. 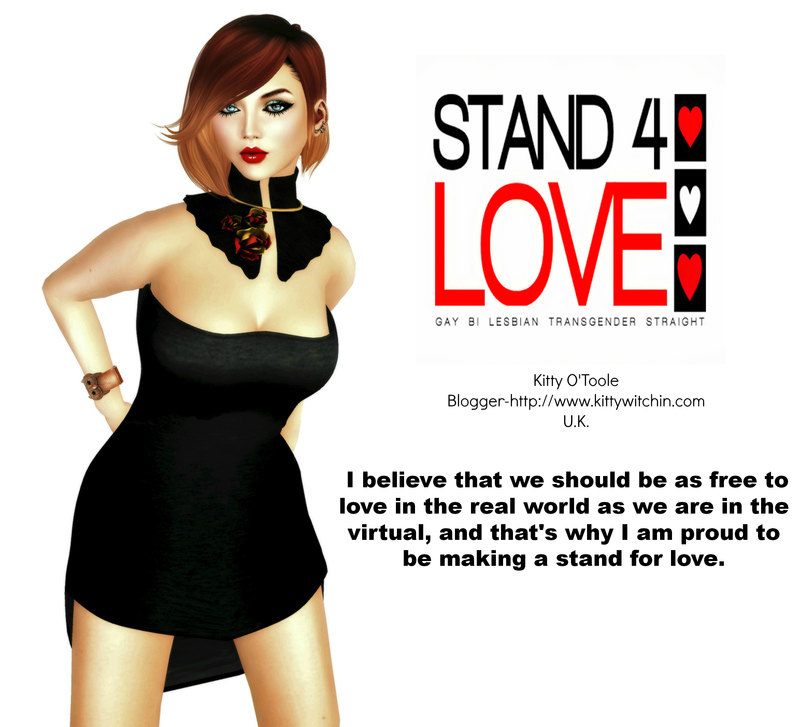 I’d hate to see the same mistake repeated, but such is the nature of Second Life. But what of the Krazy Kitty? Well, don’t lose hope yet, although these were the first to emerge and have been heavily impacted by scripting issues they have a foothold already in the market, and because they operate in a different manner are sure to acquire enough followers to sustain their growth. Krazy Kitties have a lot of great features; they show imagination and humour ( Look, they bonk to get pregnant, what more do you need?) and are, despite their disco-bright colouring, uniquely cute with some great animations. I’m not abandoning them just yet, although I fear their journey is going to be a tad more fraught than that of the Wildwood Cat. Personally I hope for a Second Life of peace and harmony where the two of them can co-exist together, but then again I’m an old hippy at heart. One thing’s for sure, the gloves are off, and neither are going down without a good scrap. I wish dogs were out, but at the decent prices Wildwood has? I’m tempted to drop some and get in onit!